Its been a pretty hectic exam period (It hasn’t really, I just didn’t really know what to start the post with!) but I’ve regardless managed to finish Watch 1, finish most of the construction of Watch 2, design and send off for Watch 3 and learn a fair bit about Visual basic along with way! Talking of Watch 2, other than an enclosure and strap, its essentially complete! Watch 2 displaying the mega digital clock! Now that I’ve incorporated 3 text sizes into my GFX library, it looks much better! To my surprise, using only two LED’s for the backlight vs 4 in each corner has worked really well! On the standard PCD8544 LCD boards too, the LED’s are 0805 size. For simplicity, I used 0603 LED’s and these seem to have worked fine though a little darker than the 0805 equivalent. I’d originally designed Watch 2 to have vertically pointing buttons though after realising how hard Watch 1 was to use, with my trusty pliers and a bit of bending, I’ve managed to side mount the buttons! Its also the first watch to use a JST connector which is nice as it somewhat stops me getting the wrong pin in the wrong socket! Because I’m a bit of an idiot however, I designed the battery connection terminals as through holes instead of surface mounted pads. What I didn’t realise is that if slight pressure is put on the LCD, the casing can short out the battery pins! On a Li-Po battery, this is an ultimate disaster as it can cause the battery to explode or other horrifically scary sounding disasters. The easiest fix I found for this was merely putting some PVC electrical tape over the connectors on the LCD side. This seems to have sorted the problem and the battery no longer shorts out. It did however mean that I blew an MCP73832 battery charger IC but they’re only about 30p each so not a massive deal. The underside of Watch 2, it looks a lot more scruffier in the picture! That Li-Po battery is looking awfully beaten up… I’d hate for it to explode on my arm! Good job I’ve got a couple of new ones coming soon. I will say however, Watch 2 seems a lot thinner than I envisaged, with the battery and without an enclosure, it sits at a thickness of 9mm, 2.5mm thinner than the original pebble! Though I’m sure adding an enclosure would increase this thickness a fair bit. Talking about enclosures, my tutor at uni (probably the most helpful man I’ve ever met!) has said that if I design an enclosure, I’m welcome to use the departments 3D printer to make one! Obviously, I wanted to take him up on the offer and proceeded to attempt to download Autodesk. Unfortunately however, this is a million times harder than it seems as I just don’t seem to be able to download it! I’m hopefully reinstalling windows on my laptop soon so I’ll have a go again at downloading it them. 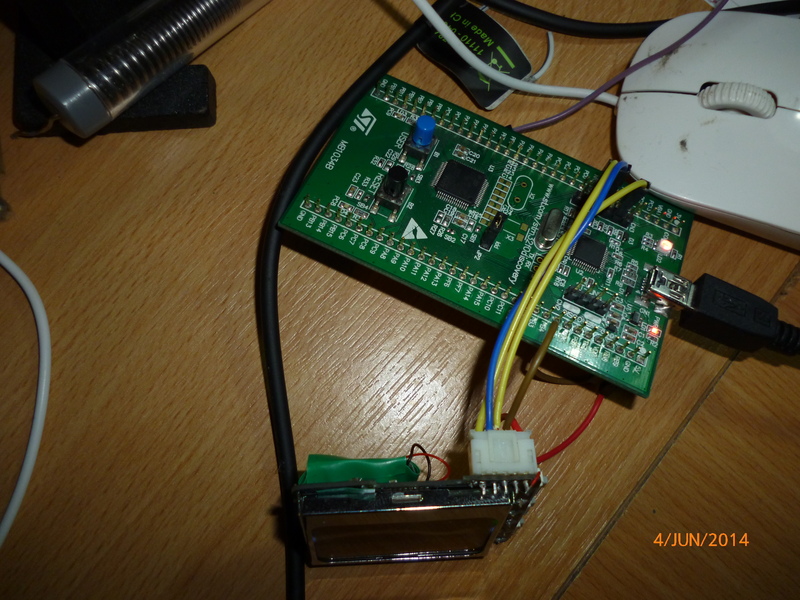 The top down view, with my trusty STM32F0 discovery as the ST-Link programmer! Once I get my USB STLink programmer stick, the discovery board will soon be replaced.